Hokai, this is VERY important to those who are bearing child to be and also post after delivering child to be, but it is just as important to those who have LOWER BACK issues. During my gymnastic years, I develope lower back problems just because my discs were rubbing against each other. I could barely swim on my front when I moved sport. This was my fundamental, my base, my permanent ground set up for more extreme physical conditions from there on. And it really helped to know and understand that we have 4 LAYERS OF ABS. And the MOST important layer is the one behind your 6-pack :). Every women needs to activate her T.V.A-Transverse abdominal muscle and pelvic floor muscles after giving birth. This is the exercise you need to do during the first 1-10 days post birth. If you have had a ‘C’ section it is better to wait for 5-14 days before you start. It is important to start activating your TVA along with your pelvic floor muscles as this is the first part in your rehabilitation from your pregnancy, labour and birth. These muscles have been severely stretched and even more so after a ‘C’ section. During your pregnancy and you will have lost or have minimal neural connection to the inner core muscle now. If you have strong TVA and pelvic floor muscles you can hold good posture whilst you are breastfeeding, carrying and lifting your baby. It will decrease the risk of back and hip pain and reduces possible post pregnancy incontinence. Exercising the muscles sooner rather than later will help to start to correct a diastasis recti (post pregnancy abdominal separation) ultimately leading to a flatter stomach and if you want to eventually get back into a regular exercise routine activating these muscles daily is a must to prevent injury. Where are these Important Muscles? The transverse abs run from our sides (lateral) to the front (anterior), its fibers running horizontally (transverse). The muscle runs transverse and is the deepest of the major abdominal muscles (the others being the rectus abdominis, and the internal and external obliques). It ends (the muscle insertion) by joining with the large vertical abdominal muscle in the middle (the linea alba), where the fibers begin to curve downward and upward depending on what direction it has to go to meet the linea alba, and below the sternum it combines with next most superficial muscle (the internal oblique). This insertion runs down by the belly button where it passes over the thick abdomen muscle (the "6/8-pack") and all the ab muscle fibers join together. 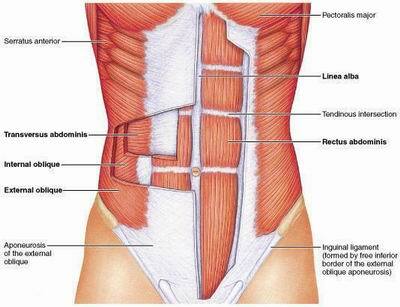 The transversus abdominis (TVA) helps to compress the ribs and viscera, providing torso and pelvic stability. The transversus abdominis also helps pregnant women deliver their baby. Make sure this is the first Exercise you do after Giving Birth and do it sooner rather than later. You don't have to engage the muscles lying down you can think about engaging your TVA and Pelvic Floor muscles together during the day. Have a look at your stomach when you are standing, sitting and when you are holding your baby and try to activate your T.V.A muscles. First think about activating your Pelvic Floor Muscle then draw your belly button in towards your spine, I think about either trying to zip up a pair of jeans or imagine you have a corset on and it is being pulled tighter, it is a subtle contraction. You should see your tummy muscles draw in; if you can see this happening, you are activating the correct muscles. You could use a mirror to help, stand sideways and watch yourself activating these muscles. From 1-14 days post birth this is the exercise you need to do try to think about activating your tummy muscles regularly when you are lifting, changing and carrying your baby. If you can concentrate on this for a couple of weeks post birth the connections will become stronger, the muscle strength will increase and activating these once weakened muscles will become second nature.